Thank you so much for taking the time to answer a few questions! We are so excited to be working with you! Firstly, can you tell us a little about yourself, your creative education and how you got into graphic and pattern design? Hello! My name is Kristen and I am the owner/designer of Fossdesign. I live in the countryside in a tiny village with my husband and mischievous black cat! I studied Animation and Illustation at University, then after graduating worked as a Graphic Designer in the corporate world for ten years before deciding to create my own design studio Fossdesign. I just needed more colour and pattern in my life! Going through your portfolio, we noticed how much you love colour! How do you come up with color pallets and what inspires you? I really do! I like my work to be fun and playful, bold and bright colours often feature in my work along with a healthy dose of more muted mid-century modern colour schemes, an era which I just love! I collect vintage items, often just for their colour...it can be anything really, I’m a bit of a magpie!! You say you are inspired by Scandinavian designs - does the English countryside, where your studio is based ever inspire you too? Yes for sure, my studio is surrounded by trees, plants and fields so naturally, I end up drawing inspiration from these every day... I love bold floral patterns, leaves, foliage and random shapes! I do like to be surrounded by colour and pattern, I think it helps me focus better! What is your favourite piece within our collaboration and why? I love my funny faces... I have drawn this style of little man and woman since as far back as I can remember... I could draw them all day as their expressions always subtly change! We love your funny faces too! You told us that you love traveling - does that in any way influence your work sometimes? 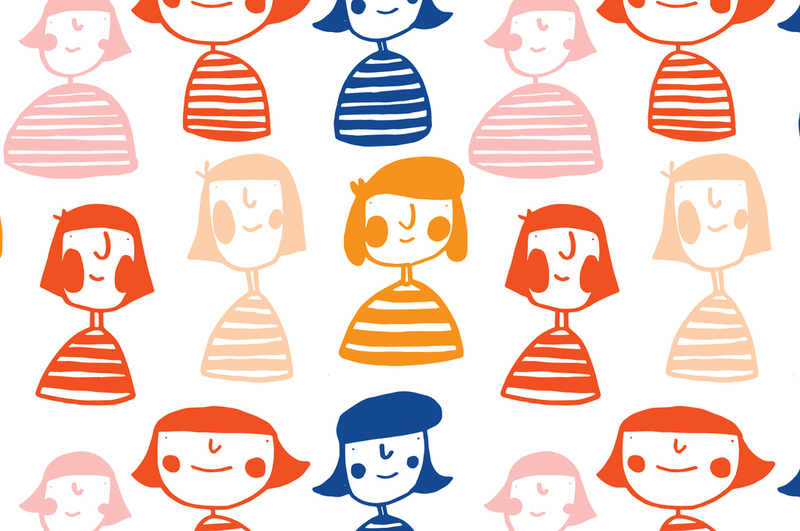 It does, maybe sometimes subconsciously either through the patterns I design or the colour choices I make. I think seeing new things opens your eyes and allows you to be braver in the choices you make artistically. The colder the place the more I love it!! Any exciting projects coming up in the new year? At the moment some branding projects for some lovely new clients... I‘m very much looking forward to working with them! I also hope to get some new pattern designs developed and out there too! Any new cats moving in? Ha! Not as yet, I think my beloved old moggie would have something to say about that, not on her patch!